Hesperidin methyl chalcone is a highly powerful flavinoid that is generally found in citrus fruits. This antioxidant is effective for diminishing the leakage of capillaries which prevents dark circles from forming all together. The hesperidin component serves as an anti-inflammatory which also reduces the swelling and puffiness that usually come with dark circles. Also having its origin from plant compounds, Chrysin is a potent flavinoid that's effective for reducing puffiness and swelling. It also has considerable anti-inflammatory properties. When used by itself, Chrysin works well to dilate blood vessels. Such dilation helps to keep capillaries from leaking which, consequently, prevents the emergence of new dark circles. These artificial pieces of collagen molecules help to enhance your skin's metabolic rate, thus, speeding the growth and cellular division of the deeper layers of your skin. Several RevitaLume™ users report a significant improvement in the texture of their skin within only a few weeks. Due to its soothing and bleaching properties, cucumber has historically been utilized as a home remedy for dark circles. Cucumber extract provides the most powerful and concentrated form of these two properties. Cucumber extract successfully reduces inflammation and puffiness around the eyes while giving a pleasing, cooling sensation. Historically, green tea extract has been used in Chinese medicine for treating poor digestion, body aches, and headaches as well as to improves life expectancy and overall health. Rich in bio flavonoids, green tea extract effectively fights free radicals. Studies have also shown green tea to be effective for lightening skin and improving overall skin complexion. Shea butter is derived from a fatty extract derived from the seed of a Shea tree. It's most effective as a moisturizer and contains amazing healing properties along with a minor sunscreen agent and anti-inflammatory agents. Retinyl palmitate is a form of Vitamin A that improves the metabolic rate of your skin cells while encouraging the smoothness and elasticity of skin. Unlike other retinoids, retinyl palmitate doesn't encourage photosensitivity. RevitaLume contains the potent antioxidants Vitamins E and C, as well as aloe vera gel, which has been used for thousands of years for its healing and soothing properties. 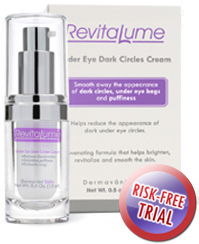 Try RevitaLume today and watch those dark circles vanish! © 2019 RevitaLume.com, All Rights Reserved.